A complete restaurant management system to simplify order management, eliminate waste and increase profitability. MarketMan is a cloud-based inventory and supply management system design specifically for restaurants. The software contains features and tools designed to simplify inventory and supply management operations. MarketMan enables you to stay in control over your restaurants inventory and other operations such as budgeting, purchasing, order optimisation, food costing, order handling, branding, catalogue and supplier management and more. With MarketMan, you can use it wherever you are, either on the your phone, tablet or PC. This allows you place orders for supplies using your smartphone app without having to worry about miscalculations and unaccounted for errors. MarketMan can help increase your profitability as you can monitor changes in prices and track errors. You can also assign specific tasks to each individual employee. The system automates all of the ordering processing, it automatically places your orders with your current suppliers. Since it is automated, it doesn’t require you to manually enter the data or make phone calls so you can focus on other key aspects of your business. Since you don’t have to be in the office to place your orders, a few taps using your mobile app and you can place orders wherever you are. Not only do you save time, you save a lot of paper in the process. Using the MarketMan software, you can view your stocks at any time which will show you the current status levels of your supplies. This also allows you to set purchasing budgets and limits. With MarketMan, you will no longer forget about having to restock your supplies. You have the option to be sent notifications whenever your inventory depletes to a certain amount so you can re-supply. You can now give other employees tasks and specific roles. By enabling them permissions, they can help place orders. Using the software, you can supervise what they are doing to prevent theft or fraud. This can result in a more efficient and easier process of ordering stock. 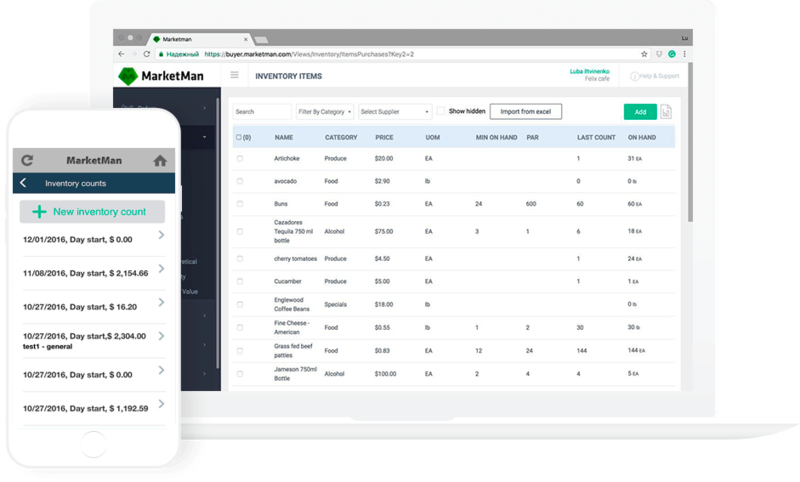 MarketMan makes it possible to set budgets and limits so you and other employees can’t over spend on stock. This can be a major issue in a lot of restaurants as most food has a certain best-by date so a lot of stock has to be thrown in the bin as there might be too much. The software will give you a clear picture of what you are spending and you will receive alerts on any credit or billing irregularities.